We spent time celebrating Bolivian Father’s day with a few more relatives and toured around the city on our final days. We saw the Plaza where we have a photo of Richard when he was little. And there are still lots of pigeons there. We saw a really cool special dance group performing when we were touring around, they were making a video, so we watched and enjoyed the colorful performance and took some fun photos there. We had pasankalla which is similar to popcorn, but bigger, I think made from puffed hominy. It is sold in big bags and is a little sweet like kettle corn. The Bolivian Olympic soccer team was there in the capital and we saw them all lined up waiting to meet some officials. We traveled so much we were worn out by the end and had to leave really early for the airport. We had to say Good bye to so much family and then again at the airport to Richard’s parents and brother who were going back to CA when we left for our flight home to CO, so it was very emotional and exhausting. When we finally left Bolivia for Peru, we had a short layover and then headed to Orlando this time. We had a long layover at that airport and our kids RAN to the drinking fountains when we got through customs because they were SO excited to drink clean water after so long of trying to search for bottled water, they were absolutely thankful and it really changed their perspective of gratitude for this simple luxury we often take for granted in the US. I will try to add some videos, but wanted to finish the trip photos with some beautiful shots Richard took with his good camera, such treasures and memories made will last a lifetime. We have said goodbye on this earth to a few of the relatives we visited, just in the last year and a 1/2 since we were there and it is a wonderful reminder to treasure our time with loved ones and absolutely to be grateful for eternal life. To God alone be the Glory! A Dios sea toda la Gloria! Soli Deo Gloria! So many more memories were made during our 2nd time in La Paz, we were eager to get to the city, to have a break from the bugs, and to enjoy time with other family members in the mountain climate. We had an entire day devoted to taking care of some paper work things, so we spent a bunch of that day waiting and getting that done. We had saltañas which were fun to experience outside of Richard’s mom’s kitchen (although we decided we like hers the best! La Paz is an interesting and beautiful city and we were blessed to have a lovely home/apartment to stay in. It was very spacious and nice for the area we were in. It was also fun, the cousin of Richard’s we stayed with this time, is a musician and neat to experience music being such a part of the family here and at home. Every Fall I start to reflect back on the changes that year, from the change in the seasons and enjoying Colorado’s display of all the colors and beauty of the snow capped mountains with Gold Aspens and green pine, to the colorful mums dotting the yard. This year I went back through a few of the photos from Bolivia as we have recently said our earthly goodbyes to another sweet friend and are celebrating the memory of several family members who we were blessed to see in Bolivia. Our day of Compassion visits ended with a drive back to the main teleferico so we could take the line back to the home where we were staying with Richard’s family members. We noticed some of these things in our drive back and our ride down through La Paz. It was a wonderful day and many memories were made, but one of the coolest God things, didn’t happen until after we returned to Colorado. Below I posted a few pictures of the kids and I in the back of Tio Samuel’s car after a very long day of traveling all over Viacha and El Alto. Many months later, we had decided to attend service at Flatirons church in Broomfield, CO, about 45 minutes away from where we live. It is a large church and we have enjoyed going there before so we thought it would be fun to catch a service there on a Saturday evening. After service we picked up all the kids from their various classes and went to get Hot Chocolate as it was a cool evening and the church has coffee etc. out in the entry way. One of the kids almost ran into a gal, and as we turned to apologize we were all in shock, it was Sara! Our translator in Bolivia who we had spent the day with back in March! We could not believe that we had run into her here, at home in CO and not even where we live! We sure enjoyed catching up and seeing her and just marveled at this awesome gift. The bottom photos are of all of us at church that day. So cool! Tio Samuel was our driver, we are so thankful! We had lots of fun with Sara! SO CRAZY, several months after returning to Colorado we randomly decided to attend service at Flatirons church in Broomfield and ran into Sara! One of the kids literally almost ran into her, ha! We drove to the 2nd Compassion center, stopped to chat with some of the older students there and they sang us a few songs. If I can figure out how to upload, I have a video of one I will add to this. We were also able to listen to them share a bit about their plans for the future, this was just amazing! These young people have such confidence, great ambitions and desire to truly be world changers, it is absolutely AWESOME to see the staff, teachers, and volunteers at Compassion influencing these children. We can not encourage you enough to get involved with Compassion International. Sponsor kids, write them, donate when you can, and go visit them if God calls you too! You will never be the same!!! The 2nd family we were to meet, has a little girl who at the time was about 6 years old. Her name is Nicole and we have sponsored her for a few years. We were matched with Nicole after we attended a Compassion Experience event. If you have not yet had one of these come to your area, check out their Find an Event page. It is a very accurate model of a home of one of the children who has a real story shared through Compassion sponsorship. You walk through their home, see how they live, and hear their story in order to better understand these precious kiddos. For our kids it was a BIG eye opener. They were actually able to walk in a center in Bolivia (and Uganda, Guatemala, etc.) in the Compassion Experience for the first time about a year and 1/2 before we actually ended up going to Bolivia. How amazing that God was preparing them, even then for this experience. We had lunch with Nicole and her younger sister Celeste. There is a procedure through Compassion that only 1/2 of the children in each family can be sponsored. So in Nicole’s family, there are 2 children, only 1 can be sponsored. Celeste was able to come to the Center and participate in the meal, activity, that day because we were there. This was absolutely heartbreaking for us to realize. All this time we had been sending Nicole, letters, stickers, little pictures, and didn’t realize there was a younger sibling at home. We can not officially “sponsor” Celeste, but now that we know about her, we can always send 2 packs of stickers, 2 notes, 2 cards, etc. And make sure to pray for them both by name, this was so encouraging to us. We then went to the main church area and they did a program for us. Make sure you look at all the photos of this, they danced, sang, and might have made a cool sign with Richard’s name on it and posted it on the wall. 🙂 He was super gracious about this, but it was kind of hilarious. They apologized because they said they didn’t know we were all coming, so they just had his name up. Which was of course fine. They gave us gifts for visiting them and they took photos with all of us. After the visit here, we went with Celeste, Nicole, and their mom back to their apartment. Their father was there and we were able to meet him as well and see some of Nicole’s school work and they had some crackers and water to share with us. (Our kids were thrilled by this and I loved watching our girls and theirs have a “tea party ” with their snack. Overall it was a wonderful day and a chance for a what we hope will not be a once in a lifetime meeting. Thankful for family in Bolivia who let us stay with them and drove us around for this amazing day. Thank you to my students from Sing Play Music studio, Group Publishing, and RCS Preschool for the donations. We were able to give every child at the centers some school supplies, and gifts as well as share some with the community before we left Coroico. Thanks for partnering with us to bless the children in Bolivia. The 2nd Compassion Center was run by the Salvation Army Church. They made a Welcome sign! All the girls were having a little tea party with some crackers and water, so cute! We were thrilled when we first started planning to go to Bolivia, that both of our sponsored children in Bolivia, are near the areas where we were traveling. We contacted Compassion to see if we could arrange a meeting with them. This is not the usually protocol, we were very last minute in all our planning, and if you are ever wanting to do this, I highly recommend planning 2 months ahead at least. Richard actually contacted the director of the center in Bolivia and that helped get our visit arranged. There were some details ahead of time, like background checks, transportation, etc. but it was all arranged and our kids were so so very excited to meet Victor and Nicole. First we went to meet a few staff members who would be going with us, Yolanda, is Victor’s tutor (teacher at the compassion center) and she sometimes writes us on behalf of him and his family since he is so young. Sarah was another translator/guide type person who works for Compassion, more about her later. We met them at the Teleférico station (Gondola is a form of public transportation, we actually took it several times while in La Paz and we were so happy we did! The ride above the cars and traffic saves time and gets you quickly from one end of the city to another. We met up with Richard’s Tió Samuel who was our official taxi driver while we drove around that day. He is Richard’s mom’s brother and loves to drive around, knows the area well, etc. He was so kind to us, and generous with his time and vehicle. We all rode together. Richard and Isaac in the back (trunk) of the small SUV, Yolanda, Sarah, and Robin in the middle, Gabriella on my lap, and Aliyah rode on Marco’s lap in the passenger seat in the front. Can you say a bit tight? This car was FULL! This carseat/booster law following mom had a hard time with the lack of seatbelts, child seats, appropriate number of passengers for the car, etc. there, but we needed to go along with what was acceptable in the culture there and the kids loved it and their mom quickly got used to it. The pictures show most of our time with them and give glimpses into the visit, I suggest reading the captions for more detail. The main takeaway we had as a family from our visit with Victor was his contagious laughter. This child is JOY through and through. He laughed and played with the kids and had a great time. He was delighted to share lunch with us and if you can see in the photo of the soup, we were a bit surprised the fish was staring at us when we sat down to eat, but I was SO proud of our kids for trying to get the bones out of the fish and eating with such beautiful manners and such great attitudes. Thankful our kids are not generally picky eaters and they did a good job here of being super polite. The Chuño (Freeze dried potatoes) are traditionally made by Quechua and Aymara communities in Bolivia. It is a 5 day process that involves taking potatoes and putting them outside in the very low night temperatures in the Andean Altiplano, freezing them, and then exposing them to the intense sun during the day. I personally tasted a few to be polite, but think the taste must be something to get used to. The kids all tasted each new food. Richard says he remembers his mom used to make them when they were younger in the U.S. but stopped because it is so labor intensive. I will share more about our thoughts after seeing Compassion centers up close, but want to share that if you do sponsor kids (through Compassion or any other organization) write to them! Write to them often, they really do love hearing from you and they showed us EVERY letter/card we have ever sent to them. They saved them all. Compassion even has an ap that you can send letters and notes online. It is really fast and easy, I have used it and the kids have even written there too. 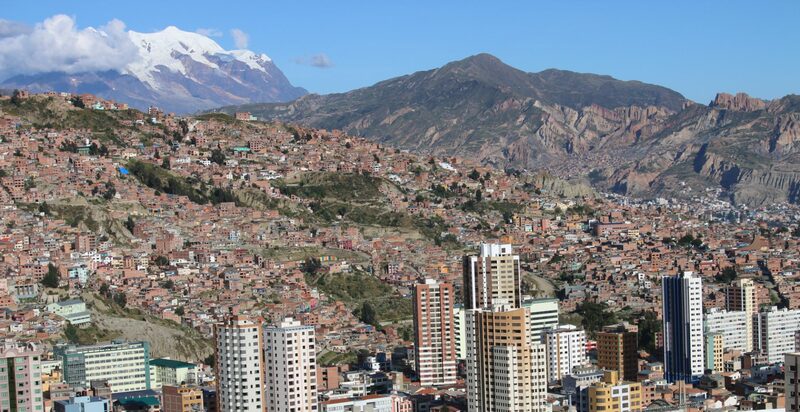 We headed to La Paz to take care of some paperwork and government office type stuff. This is a whole different ball game in South America. What we ended up doing was taking Richard’s ID card (similar to a Driver’s License in US) in to get renewed, his last one was from when he was pretty young, so he needed an updated photo, etc. and we had all 3 of our kids get ID cards. Because Richard was born in Bolivia, all of our kids are considered eligible for dual citizenship. This is AMAZING and so helpful, so we had them all get their ID’s while we were there, so they will never need a VISA to travel in and out of the country. I on the other hand, will always need to get a visa for any travel to and from Bolivia. We also ate some amazing Salteñas which were different than the ones Richard’s mom makes for our birthdays, but very tasty. All the kids loved them. We also hung out at the house there and Richard’s cousin Lismer played some amazing music for us. He has a band and plays for events and things, but we got our own private concert in his living room. If I had to describe Coroico I would say the biggest surprise to me, was the landscape was so tropical. I pictured Bolivia as La Paz is, the high desert, with mountains nearby. The tropical flowers and waterfalls were unexpected but so welcome in Coroico. The girls had Richard take photos of so many different flowers and fruits because they wanted to hang a photo of them on their wall at home. The night before we left, we took the kids to the Plaza for a little walk (the evenings are cooler there, so it is nice to get out a bit (with 3 layers of bug spray on 🙂 and Isaac got stung by a type of fire ant. He accidentally put his hand on it, but it was really scary because Richard wasn’t there and I didn’t see what bit him right away so of course my first thought was, what if it was poisonous?!? He knew right away something had bit him and was able to point it out, Thankfully Didia saw the ant and recognized what kind it was, basically it burns like wasp sting, but with some cold water and medicine the pain subsided. By the next morning, it just looked like a bug bite. Thank goodness!